Orange Park’s Hilltop Club and Restaurant was the location for the former Lorraine Taylor and Patrick Lee. The wedding party wore purple and white for the occasion officiated by St. Paul AME Church Pastor Marvin Zanders, II. Lorraine is the granddaughter of noted community advocate Gertrude Peele. 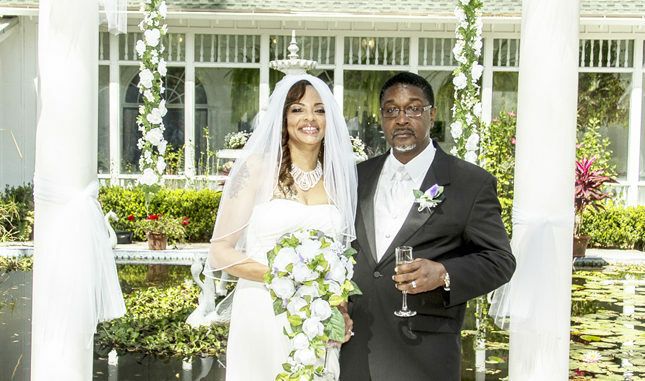 The bride attended Raines High School and holds a B.S. in Business Management with a Masters in Mental Health Counseling. The groom is a retired United States Navy officer with a B.S. in Computer Information Systems and a Masters of Business Administration and is currently employed with the Department of Navy at Cecil Field.